Split is an ultralight audio player that fits in your ears; it works without cables and without Bluetooth. Split is easy to use: To power up just "split" the earphones (...they are magnetic) and to change track and volume use gentle "﻿bite clicks﻿". Each Split earphone contains a small circuit board, a button cell battery, a memory chip, a processor and a few other components necessary to play quality digital audio. By synchronizing the right and left earphone with the use of high precision crystal clocks, the two earphones play in unison without being physically connected and without exchanging a continuous stream of radio waves. The two earphones only exchange a short near-field signal when track or volume are changed. This reduces the amount of radiation your head and body are exposed to by more than 1,000 times as compared to a Bluetooth streaming headset. To detect bite clicks Split is equipped with a 3-axis accelerometer. 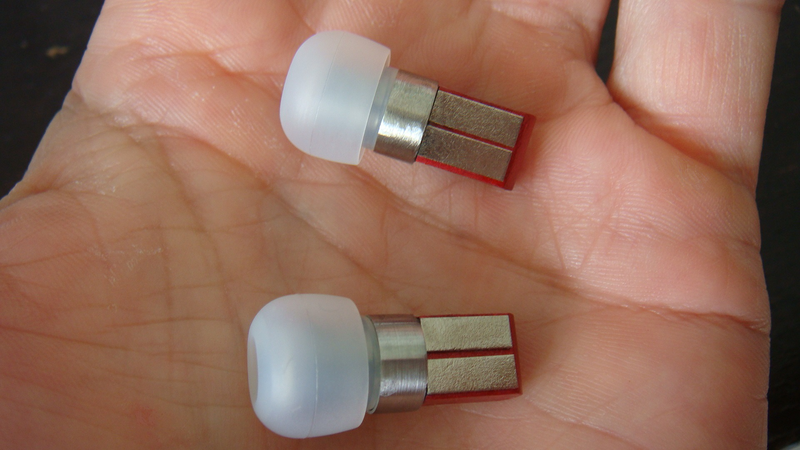 Each Split earphone contains a tiny flexible circuit on which are mounted a low power ARM processor, the memory chip, the precision clock and other components such as the audio amplifier.